Place rhubarb and water into a saucepan. Cook until tender. Stir in sugar. Bring to a boil. Cook for 7 minutes on a FULL BOIL. Stir in pie filling and bring back to a boil. Add Jello and stir very well to dissolve. Put in STERILE JARS. Let set at room temperature until cold then store in refrigerator. *Recipe Notes: Try strawberry pie filling with strawberry Jello. I usually use the red raspberry Jello, but you could use the black or now there is a Berry Blue Jello. Not fond of the Peach pie filling and peach Jello. 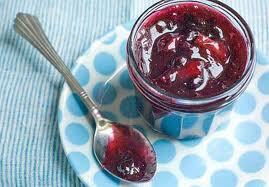 This jam is featured in Pam’s Overnight Danish Coffee Cake recipe which is delicious! We LOVE to hear from you! Please take a second to leave a comment in the box below. Thank you!